We skipped right on through invercargill really - not hanging around to see too much of the 'd*** of the world'. We stopped also at a town called Te Anau, another cute lakeside town with beautiful sparkly silver/blue water. We stopped at this town as it acts as the start of our final sightseeing trip - Milford Sound. 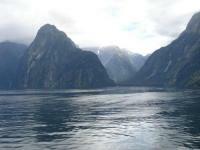 It took us a few hours to get fron Te Anau to Milford Sound, driving through the fjordland national park. Fjord meaning the landscape had be carved out by glaciers. Milford sound is one of these fjords. When we arrived we took a ferry cruise along the fjord, through the carved out mountains and right out to where it meets the sea. At some points the water was 200m deep. We passed the famous mitre peak and several waterfalls. On the way back we stopped at the underwater observatiory. This allowed us to go below the fjord and expierience the underwater environment. It was cool because it was live and anything could have passed - it didn't, we just saw a few fish, but it could have. Afterwards we drove all the way back to Queenstown to complete the bottom bus circuit. Back in Queenstown again we caught up with loads of people we'd met along the way. We spent a few days there just chilling out and making a few further plans before moving on to Christchurch.